Parked in front of the Civic Center in downtown Oklahoma City, with a steady line of customers down one side, is Junction Coffee. This mobile coffee shop is a site that you would not normally expect to see in Oklahoma. 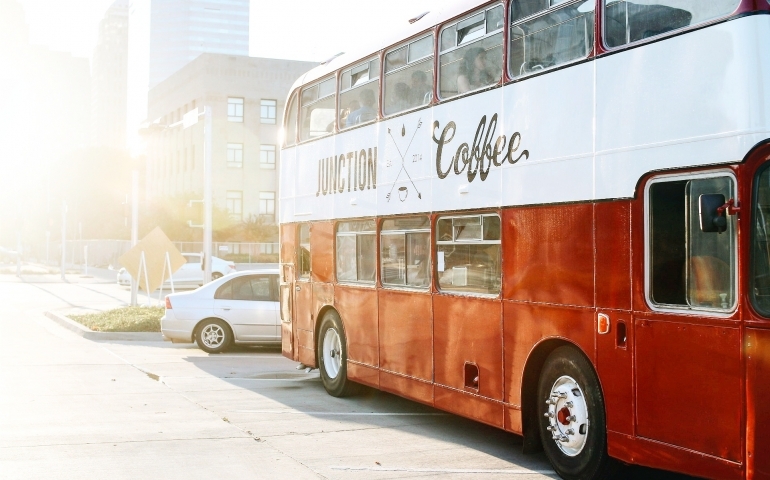 Junction Coffee’s bright red double decker bus from England is a one of a kind mobile concept. Housed within the renovated double decker bus is a fully functioning coffee shop. While the customers can enjoy the top floor of the bus to sit down and enjoy their coffee, the bottom floor is used to take and fill their orders. The owners, married couple Nick and Lori Bollinger, both had a long time vision of starting a coffee shop in downtown Oklahoma City. They loved how coffee shops brought people together and created a space for conversations to be had and relationships to be made. After several years of working in youth ministry, they felt that God was calling them to change directions and pursue their dream. However, after looking at the financial cost of renting a space to start a coffee shop in downtown Oklahoma City, they realized it was far too expensive and impossible with the resources they had. That’s when they started looking at the possibility of creating a mobile shop. They purchased a double decker bus from Hampshire, England, and had it shipped over the Atlantic ocean to Norfolk, Virginia. After picking up the bus, they drove it back to Oklahoma over the course of four days. On drawing people together through the coffee bus, Lori Bollinger said, “Everyone drinks coffee, eats toast, drinks tea or at least likes double decker busses!” Through starting this coffee shop they hope not only to share their love of coffee with others by serving quality coffee, but also to create a ministry opportunity. The Bollingers hope to build relationships with those who would not normally set foot in church by sharing their faith through conversation and the use of their “untraditional/organic church,” as Nick Bollinger described it. By visiting some of the same locations consistently throughout the month, they hope to become a regular part of people’s lives and to get a chance to share the light of Christ just by offering a friendly cup of coffee. For more information and to find out where the bus will be, check out Junction Coffee on Facebook or follow ‘JunctionCoffeeOKC’ on Instagram.